NGO Ecological Awareness and Waste Management (EAWM) conducted an awareness raising meeting in the Municipality of Gurjaani, in Kakheti region on August 30, 2016 in the framework of the ‘Clean Up Georgia – Phase III” Project. The aim of the meeting was to inform Gurjaani Municipality on the hazardous waste (in particular, chlorine/chemicals) on the territory of Georgia and its negative impact on human health and the environment. The meeting was attended by Gurjaani Municipality Governor and representatives of Gurjaani Gamgeoba (Administrative Body of the Municipality) subordinate administrative units (a total of 29 participants). 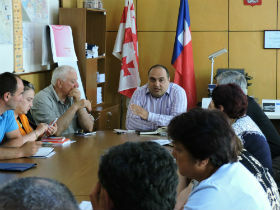 NGO Ecological Awareness and Waste Management (EAWM) continues meetings in Adjara region. On August 11 - 12, 2016 EAWM conducted two awareness raising meetings in the municipalities of Khelvachauri and Kobuleti. The meetings were held in the framework of the ‘Clean Up Georgia – Phase III” Project, which aimed at informing Khelvachauri and Kobuleti Municipalities on the hazardous waste (in particular, chlorine/chemicals) on the territory of Georgia and its negative impact on human health and the environment. In Khelvachauri the meeting was attended by representatives of Khelvachauri Gamgeoba (Administrative Body of the Municipality) subordinate administrative units, local water management service, greening, cleaning and utility services (a total of 23 participants). From August 1 to August 3, 2016, Georgian Society of Nature Explorers “Orchis” arranged meetings in the City Hall of Batumi, in Khelvachauri, Keda, Khulo, Shuakhevi, Kobuleti Municipality. Participants of the meetings were the representatives of city hall, administrations, assemblies, administrative units of the mentioned municipalities, as well as the representatives of the societies of limited responsibilities, non-for profit juridical persons and others. NGO Ecological Awareness and Waste Management (EAWM) conducted an awareness raising meeting in the municipality of Dedoplistskaro, in Kakheti region on July 26, 2016 in the framework of the ‘Clean Up Georgia – Phase III” Project. From July 27 to July 29, 2016, Georgian Society of Nature Explorers “Orchis” arranged meetings in the City Hall of Ozurgeti, in Ozurgeti, Chokhatauri, Lanchkhuti Municipality. Participants of the meetings were the representatives of city hall, administrations, assemblies, administrative units of the mentioned municipalities, as well as the representatives of the societies of limited responsibilities, non-for profit juridical persons and others. NGO Ecological Awareness and Waste Management (EAWM) continues awareness raising meetings in Kakheti region. 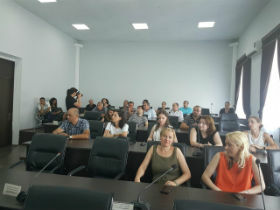 On July 19th, 2016 EAWM held a meeting in the city of Telavi in the framework of the ‘Clean Up Georgia – Phase III” Project. The aim of the meeting was to inform Telavi Municipality on the hazardous waste (in particular, chlorine/chemicals) on the territory of Georgia and its negative impact on human health and the environment.